Health economic studies are used to improve health through rational decision making by focusing on financial information, such as costs, charges, and expenditures. Economic evaluations represent a policy tool that is useful in determining the price of obtaining a health improvement by using a certain intervention compared to an alternative use. 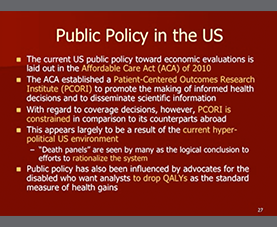 Dr. Nyman reviews the two key metrics commonly used in economic evaluations—the incremental cost-effectiveness ratio and quality-adjusted life-years. 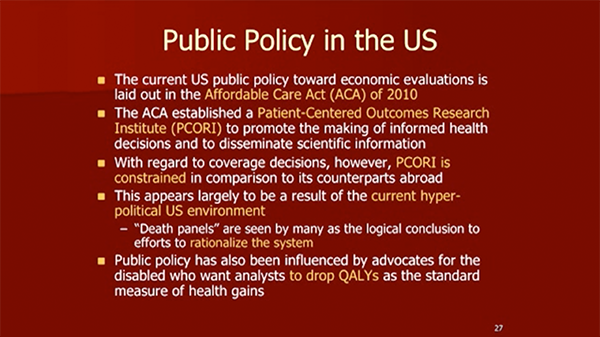 He also discusses the differences in cost analysis, cost-effectiveness analysis, cost-benefit analysis, and cost-utility analysis, and describes some areas in which these evaluations are in use today.